The sun is shining, birds are singing and we are shaking off the winter blues. Spring has arrived. However, the return of the warmer weather also marks the beginning of kitten season. Over the coming months the Home will see an increase of cats and kittens coming through its doors; adding to the large number of cats and kittens we already have available for adoption. And we have a number of cats available for adoption who have been waiting for more than 30 days who would easily fit into the right home, still waiting. Cats like Spark from our North Melbourne shelter who has been available for adoption 133 days and Campaspe resident Dudley who has been looking for a new home for 310 days. 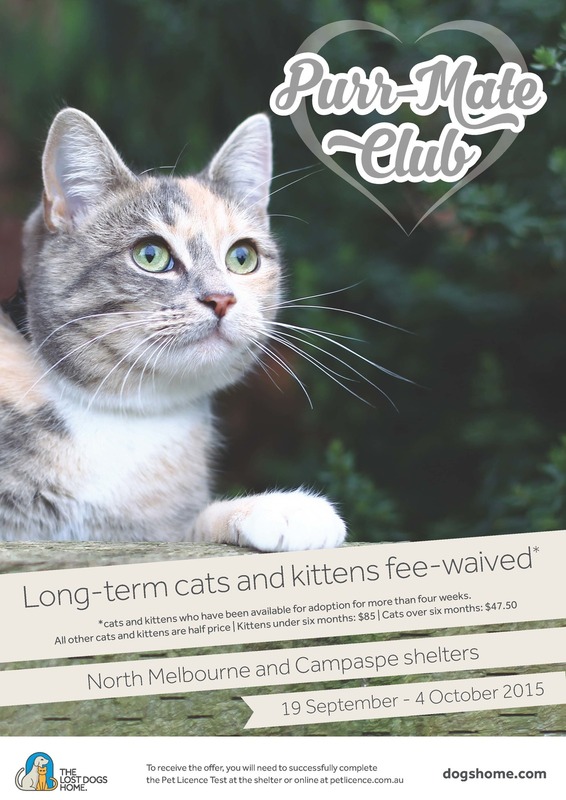 So these school holidays we are launching an exclusive club for cat lovers – the Purr-Mate Club. From September 19 to October 4 all cats and kittens who have been looking for a new home for more than 30 days will have their adoption fees waived. Cats make a house a home all year round. So if you have been thinking of adopting a cat, then visit The Lost Dogs’ Home these school holidays and meet our Purr-Mate Club cats in the fur! Adopt: View our terrific range of cats and kittens at dogshome.com. Those in the Purr-Mate Club will be marked on their profile, all others are half price at $47.50. Visit you nearest shelter to meet them in person – our staff are keen to find your perfect match! Each cat comes fully health checked, desexed, microchipped, vaccinated and wormed, all costing in excess of $300 per adoption candidate. Foster: The Home is looking for foster carers to care for cats and kittens for an average of two to four weeks. This is a tremendous way to give a cat time out in a normal home environment, while creating vital space at our shelters. All expenses are covered and successful applicants will be notified within two weeks of applying. For more information visit our foster care page. Advocate: If you cannot adopt, why not advocate for a cat currently seeking a home? Share adoption candidate profiles via your Facebook page, email or via good ol’ word of mouth!